Windows Server, Linux, SharePoint, etc. Basically this is JAVA specific stuff. AFAIK this method applies to all JIRA and JAVA/JDK editions. This is the file where the certificates used by Tomcat are stored. The JKS file is linked with JIRA in the server.xml file that is located under the JIRA INSTALL DIRECTORY\conf\server.xml (In this example C:\JIRA\conf\server.xml). Open in notepad and search for JKS to find the section we're insterested in. For this you use keytool.exe that is located in your JDK instance's bin directory. You will be asked for the keystore password that can also be found on the xml mentioned earlier. Make sure to mention the -alias parameter with the keyAlias attribute from the settings.xml file. No questions asked, the request will use the same properties as your current certificate. 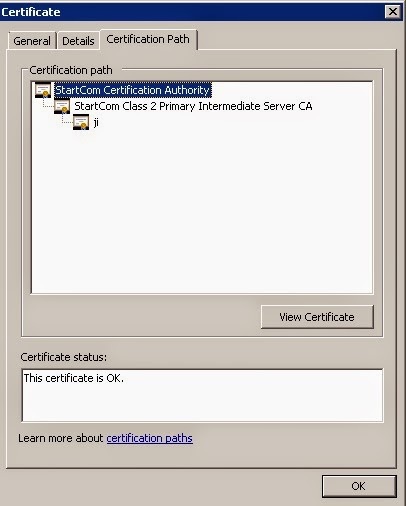 Now copy-paste the CSR from the console and send it to your CA that will issue the certificate for you. Click on View Certificate -> Details -> Copy to File and export it in the DER encoded binary X.509 format. So go back to the Command Prompt, you JAVA instance's bin directory and use keytool.exe to import all these certificates. When you're asked if you want to import the certificate, type yes at the console. C:\JDK\bin>keytool.exe -importcert -keystore "C:\JIRA\cert\jira.jks" -storepass somepass -trustcacerts -alias ca-root -file "C:\JIRA\cert\ca-root.cer" C:\JDK\bin>keytool.exe -importcert -keystore "C:\JIRA\cert\jira.jks" -storepass somepass -trustcacerts -alias ca-intermediate -file "C:\JIRA\cert\ca-intermediate.cer" C:\JDK\bin>keytool.exe -importcert -keystore "C:\JIRA\cert\jira.jks" -storepass somepass -trustcacerts -alias tomcat -file "C:\JIRA\cert\jira.cer"
Restart Tomcat (JIRA) and you're done. Short and on subject (as always :). Did some research on the market and currently these are the top Cloud Storage Providers that offer the Most Free Space and have Desktop and Mobile (iOS, Android) Sync Clients. Everyone is starting the list with Dropbox but that's outdated offering a shameful of 2GB. Note - I personally recommend Copy.com, it's a great service. Works almost just like Dropbox but you get a ton of space. You get an additional 5GB for every referred friend. Although you can scrape up a bunch of free space this way I don't recommend installing more than two sync clients on your computer because it can seriously affect the computers performance. I will update this list as soon as something interesting comes up. 5/3/14 - Adding FireDrive to #2 offering a mind-blowing free space of 50GB and no file size limit. Copyright © 2014 by Levente Rög. Powered by Blogger.